Chinese oil output and US rig count: Latest data out of China shows that the country produced 3.86MMbbls/d over December, up 2.85% year-on-year. But domestic output over the course of 2018 averaged 3.8MMbbls/d, down from 3.85MMbbls/d in the previous year. 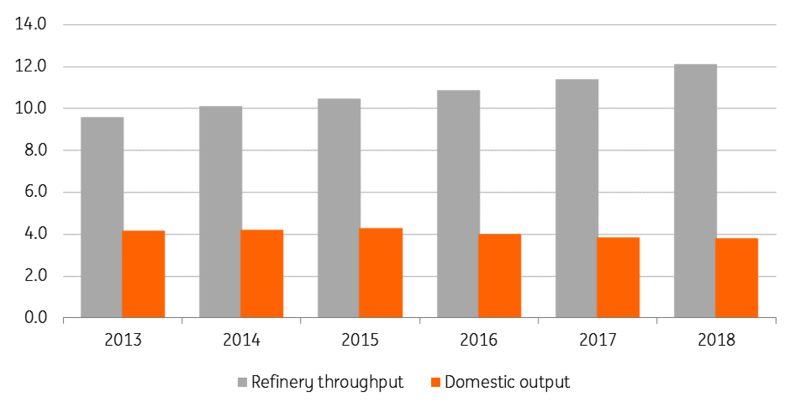 While domestic output continues to edge lower, refinery throughput in the country has grown strongly. In 2018, refiners processed 12.12MMbbls/d, up from 11.40MMbbls/d in the previous year. Turning to the US, and weekly rig data from Baker Hughes shows that the US rig count declined by 21 over the last week to total 852- the lowest level seen since May 2018. The price volatility seen over the latter part of last year certainly appears to have made producers hesitant to pick up drilling activity. IEA report : The IEA released its latest monthly oil market report on Friday, in which the agency left its oil demand growth estimate unchanged at 1.4MMbbls/d for 2019, saying that lower oil prices will help offset the impact of lower economic growth. The agency said it expects non-OPEC supply growth to slow to 1.6MMbbls/d in 2019 after growing by 2.6MMbbls/d over the course of 2018. Chinese metals output: Latest data from China’s National Bureau of Statistics shows that Chinese crude steel output over the month of December fell to 76.12mt, down 1.9% month-on-month, yet still up 13.5% year-on-year. Output towards the latter part of the year has edged lower due to a combination of winter cuts along with weaker margins. However, output over 2018 totalled 928.26mt, up almost 7% YoY. Meanwhile, Chinese aluminium output in December climbed to a record 3.05mt, up more than 8% MoM. This increase comes despite winter capacity cuts in the country. Finally, government data also shows that GDP increased by 6.4% in 4Q18 compared to the same quarter last year, and down from 6.5% in the previous quarter. Full-year growth came in at 6.6%. White sugar speculative positioning: As a result of the US government shutdown, there is little clarity on how speculators and other market players are positioned in the No.11 raw sugar contract. However, the ICE exchange is still publishing its Commitment of Traders reports, which shows that speculators increased their net long in No.5 white sugar by 4,148 lots to total 6,426 lots. We remain broadly constructive on the sugar market, with market surpluses shrinking, and expectations of a global deficit for next season.